How about that? Look familiar to Geometry students? Last semester, you guys learned that the sum of 2 sides of a triangle is always greater than the third side, right? So, this is just a more formal way of saying that. In class, I had to prove it and its inverse. Do you remember what "inverse" means in logic - also from last semester? If I have a statement that says p --> q then the inverse would be ~p --> ~q, remember? [find a primer on logic symbols from Wikipedia here.] 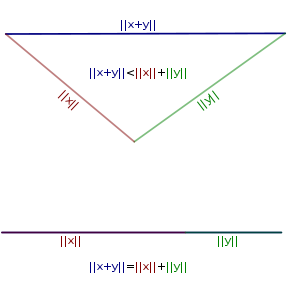 So, after some manipulation, the inverse of the triangle inequality is: \ \ x\-\y\ \is less than or equal to \x-y\. Proving it is actually easier than it looks, but it appears to be a common first question in Analysis because the proof is not obvious at first. It takes a lot of head scratching to arrive at a very simple proof. Some Analysis students take hours and hours to find the path. Why am I bringing this up on a blog oriented at high school students? To let you know that you are not alone! In fact, when we were discussing this proof in class, my instructor [the keynote speaker here! Oh, wow, looking at the list, I also had another speaker there for calculus! That's pretty cool] said that a lot of math is all about frustration. The example that he gave was that a research mathematician might work on the same problem for 5 hours a day, 5 days a week for 15 years and may NEVER SOLVE IT!! There are some math problems/theorems that have taken CENTURIES to prove; look at this summary of Fermat's last theorem. Hundreds of mathematicians over 300 years to prove it. Now that's a thorny math problem! When you are in elementary school, math - or more properly arithmetic - seems relatively straight-forward. If I do this, I'll always get this answer. 2+2 = 4. Then you get to algebra, and while there are new concepts, it still seems pretty straight-forward. If I can remember the steps, I will probably get the the right answer. Then you hit geomtery, and they start telling you that finding the answer isn't enough; you have to PROVE it! Believe it or not, this is still straight forward, but it is also frustrating. You have to justify every step and manipulation you do, which means you need to think about everything you've ever learned about math. You have to think about it in a new way. This is hard! And it can be frustrating. I've seen some of my students throw their hands up in frustration, saying, "I can't do it!" In the U.S., we have this strange idea that people are either "good" or "bad" at math. We tend to excuse people for saying they are "bad" at math, and not make them push themselves to try harder. I can't find a link to the NPR story I heard, but I'm going to put what I recall about something here. There is a report that talks about how students do in math and science compared to other students around the world. Last fall, the results from the Trends in Mathematics and Science study from 2007 were released. I was listening to the coverage about the study on NPR, and the guy that was explaining the study was asked how he explains why students from Asian countries seem to do so much better than students from Western countries. He said that it seems to be because we tend to think a person is naturally "good" or "bad" at math, once we put ourselves into one of those two categories, we don't WORK at getting better! But that people from many Asian cultures think that math takes work, so they keep working at it until they understand it! That is really just a mind-blowing concept, don't you think?? If citizens of the U.S. did not think that one had to be naturally "good" at math, we, as a country, might be able to improve our math (and therefore our science) skills worldwide! If we choose to work at getting better, even if it doesn't come naturally to us, then we WILL get better! So, persistance is key to getting better. When you don't understand, take a break and come back to it after a few minutes. Approach it another way. But don't ever give up! Here's a link to a site that shows what can happen if we don't get better. It's kind of funny, but also very sad. You know the difference between $0.02 (.02 dollars) and .02 cents, right? hmmm, my absolute value signs disappeared. I'll have to figure out why tomorrow. Now I should be studying! I have only glanced at it, but have reading it on my "to do" list, for when I have time. The NPR interview I heard was really fascinating. The way some of my students react to learning some concepts makes me think we are not teaching math well at all, so I am completely open to figuring out other ways to teach. Thanks for reading! I look forward to getting to know you on Twitter! wow, thank you. Do you mind if I ask how you found me? Jennifer has been providing quality one-on-one math tutoring in Sacramento since 2007. Please see my rate and calendar pages, and email jennifer_math_tutor (at) hotmail or call 916 296 9782 for an appointment. As our society becomes more and more technologically advanced, math is becoming more important than ever. I intend to explore math in everyday life and discuss some things my current tutoring students are learning. Join us on a journey to math literacy!